The first all-suite residence has finally opened in Baguio City. 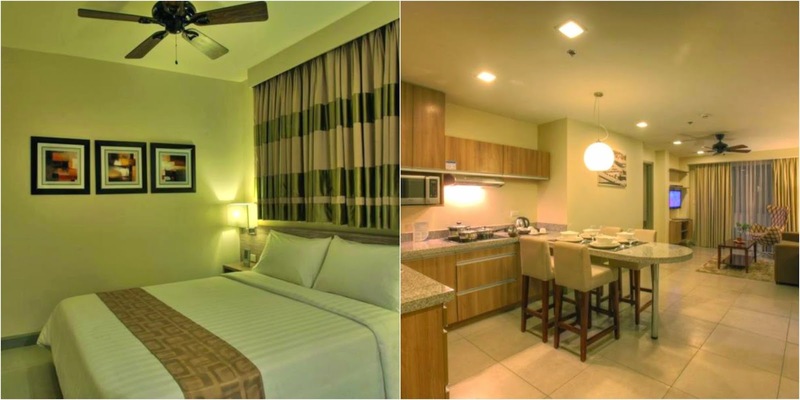 Azalea Residences presents Baguio holiday-goers the full service and amenities of a serviced-apartments, complete with living, dining and kitchen facilities in all its suites. One cannot miss the eye-catching facade that makes up Azalea Residences Baguio. The structure resembles a ski resort, clever inspiration for the Summer Capital's first vacation residence that brings thoughts of family vacations and friendly holidays. The facade sets the stage for what promises to be the best vacation ever in Baguio City. After all, nowhere else can one find a place that has the feel of a hotel and the full services and amenities of a serviced apartment. Azalea Residences is the place to be for families, friends and business travelers on the lookout for the luxury of a hotel but with the atmosphere and comforts of home. Here they can treat their room like an actual house. The hotel is located just five minutes away from Session Road, in a secluded hill that promises both the peace and quiet of country living and the proximity of the city's main attraction and happenings. Azalea Residences Baguio is made up of 99 well-appointed suite rooms: 46 deluxe, 17 one-bedroom, 33 two-bedroom and 3 three-bedroom. The suites offer the following facilities: a living room area with a sofa bed and flat screen TV with cable connection, toilet and bathroom with hot and cold shower (the two-bedroom and three-bedroom has a separate toilet and bathroom), and amenities: Dining table, chairs and crockery; Kitchen appliances and utensils; Coffee and Tea-making facilities, queen-sized beds with imported linens; balcony in chice rooms, among others. "The concept behind Azalea Resorts and Residences is to be the hotel that would offer the brand the convenience and amenities of top international hotels yet maintaining the natural texture and traditional character of the Philippines at a veyr affordable price. By infusing modern day amenities iwth thoughtful and detailed attention to the mood of the place, Azalea Resorts and Residences hopes to establish its hotel as the perfect abode for the rest and leisure." Azalea Resorts and Residences Chief Operating Officer Dulah Lipardo says. Designed with the whole family and barkada in mind, Azalea Residences Baguio offers more beyond its rooms: lobby lounge, playground, business center, WIFI connection, NDD-DDD-IDD, 24-hour Doctor-on-call, tour arrangements and vacation services, laundry and dry cleaning services, Coffee Shop, Spa and Massage services, handicap acessibility, in-room dining, and transportation arrangement to and from Manila. There are two food and beverage outlets: the flagship restaurant Tradisyon Coffee Shop, which serves traditional Filipino comfort food; and the bar called 8 Degrees Lounge. Frequent holiday goers can avail of Azalea Resorts and Residences Timehsare Vacation club membership. Members get to have access to a number of usage benefits that will guarantee a holiday unlike any other. Azalea Resorts and Residences is currently offering timeshare on special promotion. For inquiries, send an email to customercare@azalea.com.ph. Azalea Residences Baguio is located at #7 Leonard Wod Loop, Brgy M.Roxas, Baguio City. Visit their website, www.azalea.com.ph for a glimpse of their rooms and amenities. Like their Facebook Page for promotions and announcements. Also, follow them on Twitter (@AzaleaResidence) and Instagram (@Azaleabaguio).